They already have the product going or have the idea all figured out. They are skeptical of the phrase “Marketing Research” and services that charge high fees for it. They are reaching out only because someone they respect had asked them, “have you checked this with your target customers?”. They already know what they want to do, what the customers want, what the product offering should be, pricing should be – they only need to do a survey to validate these. They are not willing to pay anything for me because all I have to do is write up a survey for them. I turn away all such requests. The primary reason is, I currently advise two small businesses, one from Boulder and one here and I cannot take on more unpaid work. But there is another reason as well: they are solving the wrong problem. If these people are convinced about their path, looking only for validation and not willing to change their path based on the data, why bother with a customer survey? 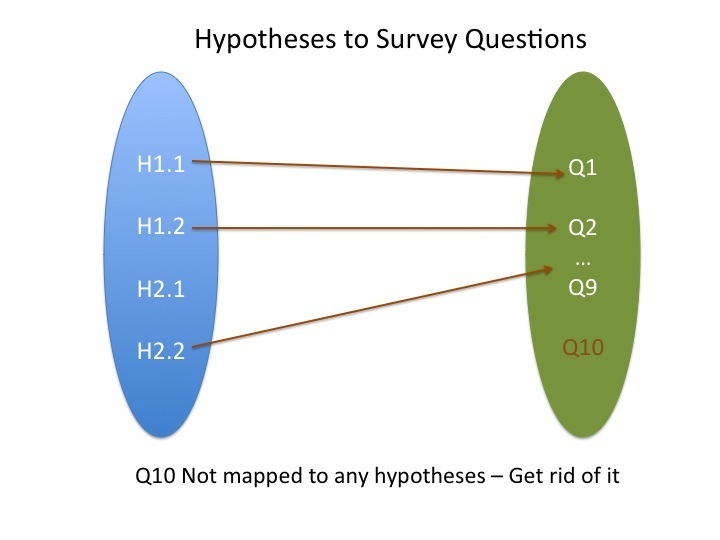 You should not jump to do a survey if you have not formed a few hypotheses that you want objectively tested. You should not launch a survey that is not designed based on extensive exploratory process – one that involves multiple customer interviews and focus groups. If you have not talked to single potential customer you are targeting, running the survey is the least of your concerns. A survey is ineffective if you have not uncovered distribution of your customer profiles, likes and attitudes. Asking respondents to write an essay of their problems and likes in a survey question is simply wrong! A survey is ineffective if you have not uncovered your “customer speak” and you continue to use your techno jargon speak. A survey is ineffective if you slapped together a few questions that don’t help answer your decision. A survey is ineffective if you collect data from where it is convenient, like the drunkard searching for lost keys under the light because it was dark where he lost it. A survey is ineffective if you have not identified the target population and found a way to reach them and are not willing to spend resources to reach the right target. If you are convinced you are in San Diego, when you could be in Madagascar, looking only for white sandy beaches to validate your conviction and not willing to seek data that will show otherwise – you do not need a survey! So you did a survey, received great response rate and found a great percentage of people prefer your product. Or you see a study quoting a major survey from a renowned market research firm that finds, “customers are willing to pay price premium for great customer service”. We can take these results on their face value and act on it, or we can ask some key questions to see the errors in the way survey us conducted or the data is analyzed. In today’s WSJ, Carl Bialik, who writes The Numbers Guy column points out some of the common yet not so easy to recognize errors in surveys and interpreting the results. Leaving out Key Groups: While researchers take care to find a representative sample of people, the survey population may limit or omit a few key groups that can skew the results. The worst form of this is using “convenience sample”, surveying only those that are available to us rather than the target population. Respondent Honesty: There is inherent challenges in getting respondents to answer the survey honestly. Be it about a sensitive subject or simple intention to purchase we tend to mask our responses or give responses that we think the survey taker wants to hear. The problem is worse when the survey is administered in person or over telephone. Losing Segmentation Differences: There may not be enough representation of sub-groups to make any segmentation differences. On the other hand if there are enough samples, ignoring segmentation difference and treating the data only in aggregate may show a completely different aggregate result. Hidden Variables: This is the flip side of the point above. Responses to a question could show statistically significant difference between two segments. For example, women may state higher willingness to pay for Green products than men, but it hides hidden variables that are not accounted for by the survey. Not Asking the Right Question: The survey simply may not have asked the right question, be it the correct vernacular of the target population or asking unambiguous question. Not Seeking Data for All Hypotheses: The survey may narrowly focus on one hypothesis and seek only data that will prove or disprove that hypothesis. Data can fit any number of hypotheses, before designing the survey all those must have be surfaced and must be included in the survey. For example, WSJ surveying parents about their children’s performance and WSJ subscription may fail to ask about other things the children do, parent’s education and involvement.